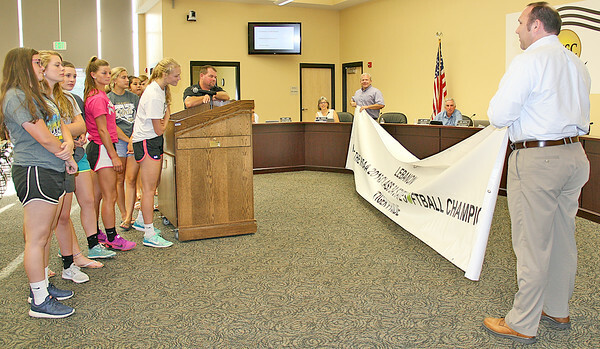 LET'S HEAR IT FOR THE GIRLS: The Lebanon Community School Board presented the Lebanon High School girls' softball team with a banner announcing their championship title at the board meeting on Tuesday. The banner reads "Lebanon; The IHSAA 2016 Class 3A Softball Champions; Tiger Pride." Though the placement of the banner is not yet set, it will likely hang either inside or outside the gym during the off season and along the outfield fence during the season, said Robert Taylor, Lebanon Community School Corp. superintendent. "We can get a second banner next year," Taylor told the girls who would be back next season.